Rebecca at work with some special guests! Rebecca was one of my closest friends during my College Program. She was actually my one and only Blog of the Month way back when, and made some appearances in my DCP Experience Vlog! She worked in my favorite park, and I'm super happy that she was able to share about her experience with all of you! 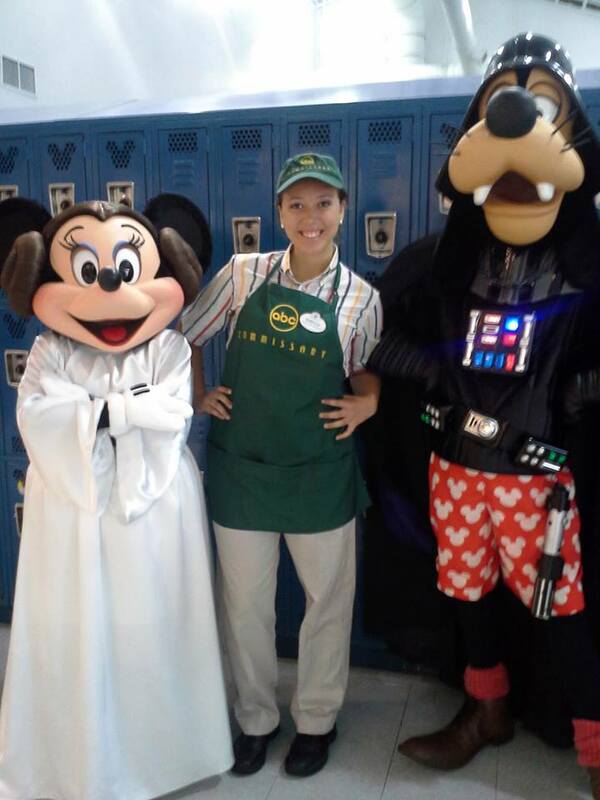 I worked in Quick Service Food and Beverage at ABC Commissary in Hollywood Studios. I really loved my area and enjoyed the role a lot more than I had expected to! A typical day for me at work was working a little after opening until close. ABC opens up two hours after Hollywood Studios opens, so when the park opens at 9, we open at 11. I would usually start around 11:30. Closing varied every day. ABC closes half an hour before park close. So whenever there is EMH (Extra Magic Hours) the park would be open later, resulting in ABC also being open later. The Studios usually had about 3-4 different closing times a week, so I would get off anywhere from 8:30 to 10:00 pm. CP’s pretty much ALWAYS close the restaurant, which means I would get off at park close. I would usually work 8-9.5 hour shifts, 5-6 days a week. Once in a while a rare 6 hour shift is thrown in to my schedule, from 4-10. But I would almost always trade for a longer shift, just because on days that I was working, I would rather work longer and get paid more. The busses for DHS ran about every 35 minutes, and from Chatham to DHS it was a 45 minute bus ride, so it was a hit or miss on how early I would have to get to work. I.E., if my start time was 10:30 one day, I would have to catch the bus around 9 to get to work by 9:45. If I wait for the 9:31 bus, I would get to the CP bus stop at 10:15, which would be cutting it pretty close to get to work. But if I started at 10:45 the next day, I could take the 9:31 bus and have plenty of time. 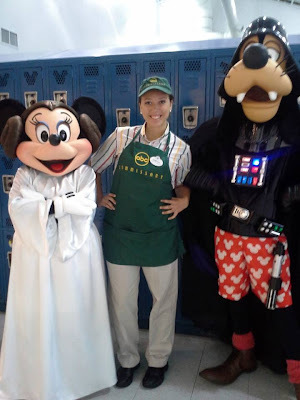 After I got off at the bus stop outside of cast services, I would usually get a new costume for work, since costuming is right inside the cast service building for DHS. If I had at least a half an hour to kill before work, I would always get a new costume. It’s also a lot more comfortable to wear regular clothes on the bus to work and then change in the dressing rooms. Then I would cut back stage to ABC (I LOVED being able to walk through streets of America to get to work! ), drop my stuff of in my locker, then walk to the CDS computer to clock in. ABC is a unique location, as we also share the same building as Sci-Fi Dine In Theater. So, we share a back kitchen, a GT, etc. I was able to meet people from a new location right in my area right away! Once I was clocked in, CDS would give me an assignment. During my time at ABC, I was able to do basically every job there. Options were: Fryer (frying the fries, chicken nuggets, shrimp, and fish—I hated this at first because the baskets were so heavy and I would always burn myself. I have 4 scars on my arms from being on fryer……my friend from work calls them Mickey Marks), Kitchen Assistant (running the food from the fryer to the line), Grill (grilling burgers and chicken), Stocker (keeping everything stocked up everywhere in the restaurant—this is the only job I was never assigned to. Although I did close stocking twice), Line/Wells, which entails of three positions: Anchor (putting plates on trays, putting together kids meals and sending them down the line), Middle (Putting the burgers, chicken sandwiches together, fish and shrimp platters and putting lettuce, tomatoes, pickles and onions on the sides of sandwiches) and Window (putting fries on the plates and sending the food to counter), Toaster (toasting buns for both sides of the line), Salads (hand tossing all of the salads ordered for the whole restaurant…..this was a high stress job but I was beast at it! If the restaurant was slow toaster and salads would be done by the same person), Counter (carrying the food from counter to the guest at their counter), Drink Filler 1 (Making all of the drinks), Drink Filler 2 (running the drinks and desserts to the guests), Cash (taking guest’s orders), Condiments (filling both sides of the condiment bars---keeping all of the sauces filled, plasticware filled, etc), Bussing/Trash (bussing tables and taking out trash---my least favorite job), and the best, Prep (getting to be in the back with a few friends getting everything ready for the next day—like making the burger/chicken set ups with lettuce and tomato, or making salad dressing, making power pack kids meals, or anything of that sort). In order to close the restaurant one person was assigned to each position to close. We have half an hour to close our position so everyone can go home. I was pretty fast at closing, so I would stick around to help anyone else close their position. 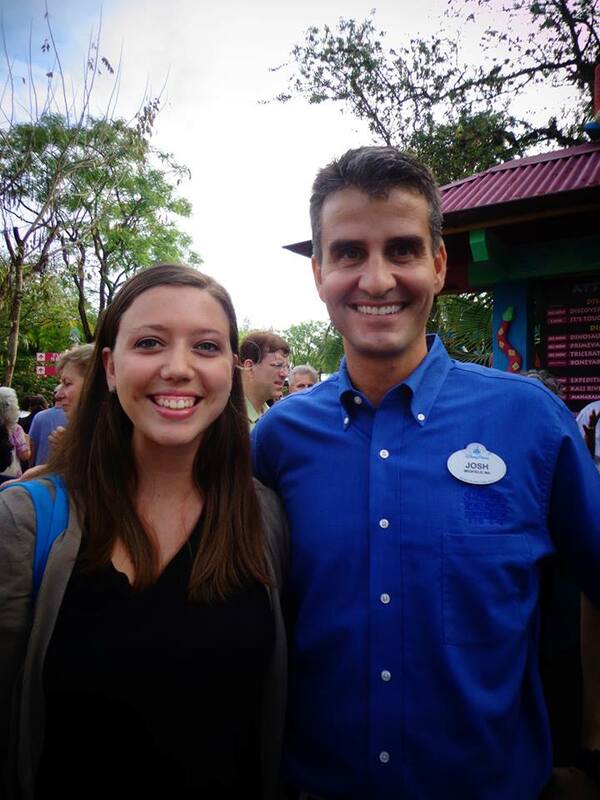 Rebecca with the VP of Animal Kingdom! Not even close! 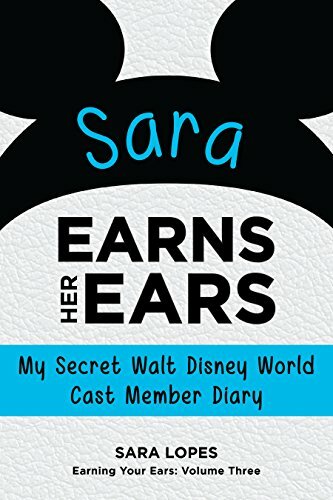 Even in the interview I was asked questions about attractions, lifeguarding, and PhotoPass. QSFB was one of my picks for little or no interest, so I was skeptical to take it. Especially since I had never worked with food before and I had heard horror stories about getting that role. Honestly, the job isn’t anything special. But the people who worked with me and the guests that I got to interact with made my experience. I was very happy I got it, and ultimately I decided to stay seasonal with Disney after my program. I ended up getting a job as campus rep for my university, so now that is my status instead of seasonal. My favorite parts of the job were definitely the people I had the chance to work with, and my location. Where else do you get to walk through a Disney park every day to go to work! Working at ABC is like living a soap opera. I made some of my closest friends there, and there was always some sort of drama going on, and most of the time, it was very entertaining. I loved being on register and getting to interact with guests, and I really grew to love working in the kitchen, making salads or running the line. My least favorite parts of the job were definitely bussing and counter. Because who wants to pick up trash? Yeah, you do get to talk to guests. But most of the time they are focused on eating and want you to clean up after them. I also hate being on counter, because then everything that goes wrong through a guest’s perspective is placed on you. My favorite magical moment happened around St. Patrick’s day. At ABC, we don’t usually get to do very many magical moments, as the guest flow is always very constant and busy, not allowing us very much extra time to do things. This particular day it was fairly slow, and I was put on outdoor bussing. (I would much rather be outside than inside—less tables and more people to talk to!) A 10 year old boy and his dad were sitting at a table outside. We started talking, and I learned that his birthday was the following week and that they were celebrating it! It was his first time at Disney, and his family didn’t know about the buttons, so I would have never known it was his birthday otherwise. If you have ever been to a Disney park while wearing a birthday button, you know that you do get treated a bit more special. So, I told the family that I would be right back. I ran inside, got one of the special St. Patrick’s Day Mickey cupcakes, and brought it out and sang the boy happy birthday. He was so happy, getting a hug from him was so special! By this point his mom had come out with the food and she took a picture of us together. I made sure they got a Birthday button for him so he could show off what they were celebrating! I have always loved Disney all my life. I grew up in Michigan, and my family never took trips to the parks until we moved to Florida when I was in 8th grade. 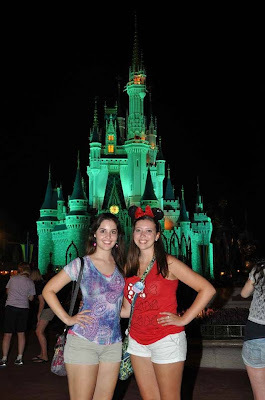 From then on I loved learning about the history of Disney and visiting the parks. I was a senior in high school when I found out about the college program, and knew I would eventually want to do it while I was in college! During the fall of my freshman year I applied just for the heck of it, figuring I wouldn’t get in since I was a freshman. But then four days after my phone interview, I got the email saying I was accepted! Me and Rebecca on her last day in the parks! I wish I knew how much you really work, and how hard it can be some times. I figured we would have tons of time to play in the parks and do things around Orlando. Also, you can’t expect to find the guy of your dreams during the DCP. More than likely if you get involved with someone you’ll just end up with a broken heart, because the relationship won’t go past the program (trust me, I found out the hard way). Expect long and hard hours, and dealing with hangry (hungry+angry) people who have been outside in the parks all day, waiting in lines for rides who don’t want to wait longer than 2 minutes for food. But the experience is definitely worth it. Be willing to take advantage of any free time you have to spare. You don’t have much of it, so spend time with friends (because you’ll make some of the best friends of your life). Go to the parks after work, even if you’re tired and it’s only open for a few more hours. After you left, you’ll be glad you have some crazy pictures or that you got to go on a ride another time, or see Wishes AGAIN. You’ll miss it after you leave. Also, be willing that real life happens. Maybe you don’t get in the first time you apply—that’s ok, you’re just not meant to do it right then. Keep applying, because I wish that everyone got to experience one college program during their college career. If you have any questions for Rebecca about her experience or her role, you can find her on Twitter and sometimes on Tumblr! I can also ask her questions for you if you cannot reach her on these sites.